Field Day, Victoria Park, London. A week today. Featuring John Cale, Faust, Mark Kozelek and lots more. ‘Apollo… seems to me to be the most perfect imaginable expression, embodiment, symbol, of the twentieth century’s central contradiction: namely, that the more we put our faith in reason and its declared representatives, the more irrational our world became’. First published in 2005, 'Moondust' arose from journalist Andrew Smith's realisation that now only nine of the twelve Apollo astronauts who walked on the surface of the Moon are still alive - and that one day in the not too distant future, there will be none. 'I wanted to know what kind of people they'd become and what they'd learned; how they felt about the weird trip now and whether they thought it had changed them. Even more than this, I wondered why I suddenly cared when I hadn't before'. This last statement demonstrates what makes Smith's writing so accessible and enjoyable: his candid approach to the subject. 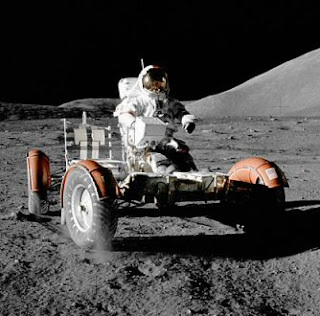 His quest to track down and interview the remaining nine (and, in some cases, the harder task of getting them to speak freely of their experiences) is a personal one: Smith was born in America, watched the 1969 Moon landing on TV as a young child and was fully immersed in the contemporary pop culture. What relevance and influence did the Moon landings have on the world at that time? And what is their legacy? 'Moondust' is full of anecdotes and observations that are amusing and fascinating: the astronauts' children complaining of their fathers 'just' being astronauts because for them it was the norm; Charlie Duke's terrifying dream in which he and John Young met their doubles who had been on the Moon's surface for thousands of years; practicalities of going to the toilet in space; the startling fact that all twelve astronauts were either first born or only sons. Smith's book brims with such things, alongside his consideration of issues such as the lack of female Apollo astronauts, the political motivations that drove the programme, the reasonably common belief that the Moon landings never actually took place, and the arguments for and against returning. I highly recommend this book to anybody who has an interest in the Moon landings or the era in which they happened. It is extremely well researched and engagingly written.